Founded according to legend in the 7th century, even before Venice was located here, San Salvador marks the spot where a vision of Jesus appeared in a cloud of red dust. 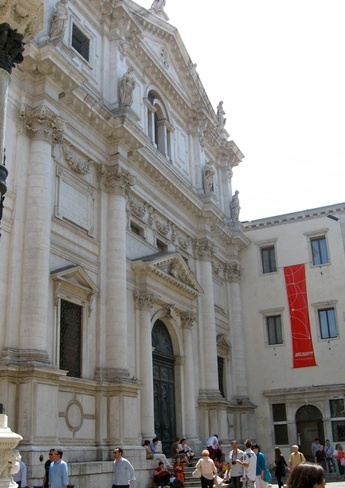 The current church was rebuilt beginning in 1508; it has a remarkable Renaissance interior by Giorgio Spavento and was completed by Tullio Lombardo and Sansovino. Its unique design imaginatively fuses a long, two-aisle basilican nave with a central Greek cross plan, by stringing together three Greek crosses, three domes and three transepts, and tying them together at the corners with pilasters and mini-cupolas. The clean lines and lack of decorative encrustations let the eye enjoy the interplay of space and light. Sansovino also contributed the Tomb of Doge Francesco Venier (d. 1556), sculpting the fine figures of Hope and Charity at the age of 80. But Venice was known as a city of old men; the Maggior Consiglio even devised a special committee for patricians over 80 to keep them occupied with affairs of state until they dropped dead. At the age of 89, Titian painted the excellent Annunciation by the next altar, an unusual work that he signed with double emphasis Titianus Fecit. Fecit. (because, it is said, his patrons refused to believe that he had really painted it). The right transept contains the Tomb of Caterina Cornaro (d. 1510), queen of Cyprus, at least for a little while, before the Republic convinced her of her duty as a good Venetian to cede the island to direct Venetian rule. In exchange for Cyprus Caterina got Asolo, where luxurious ennui was first distilled into a fine art, and when she died she got a funeral fit for a queen and this better-than-middling tomb, with reliefs by Bernardo Contino. Just to the right of the altar in a glass coffin are the relics of Venice's first patron saint, Theodore the dragon slayer, wearing a silver mask (his confraternity, the Scuola Grande di San Teodoro is catty-corner to the church). On the high altar, designed by Guglielmo de' Grigi Titian’s badly-restored Transfiguration stands in the way of a more impressive work of art: a 14th-century silver gilt reredos made by Venetian goldsmiths and, after the Pala d’Oro in St Mark’s, their greatest masterpiece. This, unfortunately, is exposed only during Holy Week. To the left is another painting that upstages Titian, The Supper at the House of Emmaus by a pupil of Giovanni Bellini. In front of the high altar, a glass circle set into the floor permits you to see a recently discovered merchant’s tomb, with damaged frescoes by Titian’s brother, Francesco Vecellio. The third chapel on the left holds statues of the two major plague-prevention saints, Santi Rocco and Sebastiano, by Vittoria. The church's rich treasure, one of the most lavish in Venice (somehow Napoleon missed it while pillaging the city) has precious gold, silver and enamel reliquaries dating back to the 13th and 14th century. Hours Church: Mon-Sat 9am-noon and 3-6.30 pm; Sun 3-7; June-Aug Mon-Sat 9am-noon and 4-6.30pm, Sun 4-7. Treasury: Tue-Fri 10am-6pm, Sat 10am-2pm, Sun 2-6pm; ring ahead 00 39 3386025727 Tues, Wed and Fri from 9am-noon to book. For a guided tour of the church, book ahead at 041 241 3817 or email turismo@patriarcatovenezia.it.